What type of Motorcycle Helmet should I use? There are several types of helmets available and depending on the purpose (or your ride), you may need a certain type of helmet. Just because you’re wearing a headgear considered as a helmet means that you have the optimum protection for your head. Because there are different types of helmets, each with its unique purpose for the needs of the rider, it is imperative that you wear the most suitable one. Though the different types of helmets slightly differ from each other, they have their own unique characteristics that set them apart. To know more about the different helmets available in the market and the best one for you, read through. There are three major types of helmets: Full-face helmet, three-quarter helmet or open face, and shorty or half-helmets. The best out of the three is definitely the full-face helmet because it is capable of providing full protection not only for your head, but also for your face, jaw, and cheeks. Half-helmet or Shorty – This type of helmet offers the least protection out of the three because it only covers the top of the head up to the tip of the ears. A strap that can be locked and unlocked underneath the chin holds the helm. It leaves the face, cheeks, and jaw and is not recommended for wearing during high-speed rides. In some cities, it is also illegal to wear this type of helm when riding on highways or freeways. The helmet is good only for wearing when cycling or riding a motorbike around the neighborhood in a fairly slow pace. It is also good if you’re not intending to ride for long hours (if you’re only going to a trip to the grocers, pet shop, etc). The pros of half helmets are that it is very lightweight and comfortable. It also provides the most visibility out of all the types of helmets. 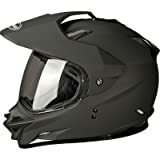 The downsides are the lack of full protection and visor that allows dust, dirt, and elements to touch the exposed face. Three-Quarter helmet or Open Face – This helmet lies in the middle of half-helmet and full-face. It covers the head up to the back but leaves the face exposed. Similar to half helmets, this is only good for short rides at low speed. This isn’t recommended for high speed drives because the open face exposes it to dirt and the elements. The large opening also allows for wind resistance, which can cause neck strains when worn at high speed. Also, when an accident is met, any impact caused on the chins and jaw is known to radiate onto the entirety of the head, nulling the use of the helmet – It’s as if the person is not wearing any helmet at all. Bear this in mind when opting for this helmet during long rides, believing that it has the same security protection as full-face helms. The pros of this helmet are the same as half helms. 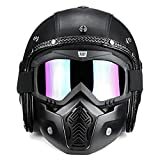 Durable, firm and sturdy, long life performance| Breathable and soft lining, comfortable to wear while riding| Detachable goggle mask and lining, easy and convenient to wash.
Classic vintage style motorcycle helmet design, eye-catching, fashion and cool. Lightweight ABS and PU leather shell enhanced by EPS buffer layer, effectively reduce shock and impact, protect your head easily. 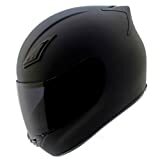 Full-face helmet – This is the best helmet that you can get for protection. It comes in a variety of styles, sizes, and shape to suit the needs of the rider. 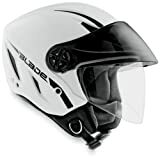 It is the most common helmet as it covers the rider’s entire head and face, leaving only an opening for the eye area, which is covered by equally strong and durable visors. Full-face helm are rather bulky but there are ones made from lightweight materials so that the wearer won’t suffer stiffness and heaviness during long rides. The round shape is also great for having very little wind resistance so it is also great for protecting against neck pains. Touring – This helmet is great for riders who go for very long travels. The helmet is designed not only for protection but for comfort as well. This helmet has great ventilation to keep the air circulating around the head and face area. Touring helmets are also generally made of lightweight materials while still being effective and sturdy to protect the head. Modular – This is a cross between a full-face and open-face helm because it allows the rider to completely expose the face by lifting the front part of the helmet open. This is great for riders who want to have protection and at the same time expose their face as a breather after long rides. Adventure Touring or Dual Sport – This helmet is a cross between a street and dirt helmet. The helmet is designed with aerodynamic properties for high-speed riding but can be suitable also as a touring helmet. 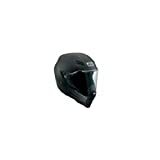 It is versatile to suit different riding conditions as it has both a visor and face shield, which offers extra-wide peripheral vision. Dirt/Motocross – This helmet is very unique and is meant for dirt and motocross riding. The helmet is designed in a way where the sun visor and chin section are elongated. This feature offers the rider protection from dirt and debris kicked by other bikes. The helmet also has numerous vents in it to allow for good air circulation because this active sport can greatly generate heat. Key Takeaway: Full-face motorcycle helmets are definitely the best out of the bunch, no matter what the purpose. If you are buying your first helmet, make sure to check out the full-face helmet rack because that is where you’ll get the one that is capable of full protection. It is illegal to go out riding a motorcycle without a helmet and to some countries, it is a criminal offense that can get you to jail. Always remember to wear your helmet for protection all the time when going biking. Most importantly, get a full-face helmet suitable for your needs. What are the Top Rated Motorcycle Helmets? Helmets are a must-have when riding a bike, no matter how short or long the distance. All states in North America require all riders and their passengers to wear DOT-certified helmet. Not abiding by these rules can easily give you sanctions. Therefore, it makes the helmet one of the important things you should have if you own a motorcycle. Wearing a helmet doesn’t only provide you safety, but it also makes the ride much easier, especially if you’re riding at high speed as it protects the eyes and the face from the wind. There are tons of helmets out in the market and it can be a bit difficult finding the best one for you. To make the search easier, we have listed below some of the top-rated motorcycle helmets that are worth checking out. 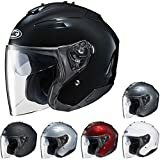 What are the best-rated motorcycle helmets on Amazon? If you are a frequent shopper on Amazon, you’ll be surprised that there are tons of great finds in there. You can also check if the motorcycle helmet will work for you through the reviews and feedbacks left by other customers, which make the choosing process much easier. In this article, the helmet types are categorized so you can easily see the best-rated products according to their type. This helmet is rated 4.1 out of 5.0 stars coming from the reviews of 25 customers. What they liked about this product is the inner lining that adds padding to your head in case of impact. The helmet is also true to size and the straps are sturdy. The helmet is on the heavy side so it’s not recommended for long rides. Overall, the quality of the helmet is good – one that won’t break easily. 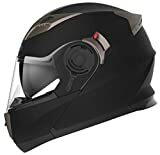 SM 54 - 55 21" - 21 5/8"
MD 56 - 57 21 3/4"- 22 3/8"
LG 58 - 59 22 1/2" - 23 1/8"
This helmet is rated 4.6 out of 5.0 stars coming from the reviews of 56 customers. It has several sizes, ranging from small to extra extra large. For the price, this half helmet does its job well and is made of quality materials that is able to protect the head from impacts. What customers love about this product is the perfect fit and comfort. Unlike the previously listed half helmet, this one is also lighter so it can fit snugly on your head without putting too much pressure on the neck. This helmet is rated 4.6 out of 5 stars based on 94 customer reviews, making it a favorite among open face helmets on Amazon. It comes in a variety of colors and sizes, from extra small to extra extra large. It is made of advanced polycarbonate composite shell with sunshield and visor. What customers love about this product is the comfort and lightweight feeling while wearing it. The helmet comes with a ventilation system that keeps the head cool all throughout the ride. The visor is also very effective at blocking the sun and can be easily retracted with just a push of a button. This vintage-designed helmet is rated 4.3 out of 5 stars based on 35 customer reviews. The best thing about this helmet is not only the vintage design that made the Bell helmet brand popular, but also the custom fitted fiberglass shell that hugs your head comfortably. Customers got this helmet because they’re looking for a retro helmet that can make them stand out in a crowd. It also fits great and feels comfortable and lightweight. Some cons worth noting about this product is that it doesn’t have a sun visor so you have to separately purchase that. It also doesn’t have a lining so you’ll have to wear a bandana to manage the heat and sweat. This helmet is rated 4.4 out of 5 stars based on 29 customer reviews. What customers like about this product is the fact that it is the best when it comes to the safety. It conceals the entire head and face while leaving an opening for the eyes, which is covered by two visors (clear and tinted). The structure of the entire helmet is also different the traditional shape and design. When worn, it has an edgier look and when paired with some leather jacket and boots, the rider will look completely badass. It doesn’t only look good but it is also very comfortable to wear. The measurements for the sizes are spot on so you’ll be able to find accurate sizing. There are vents for air circulation and inner padding. This modular helmet is rated 4.6 out of 5 based on 186 customer reviews. 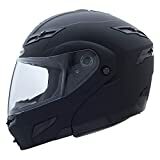 It is one of the top-rated motorcycle helmets on Amazon and also one of the most affordable considering the structure and materials used. 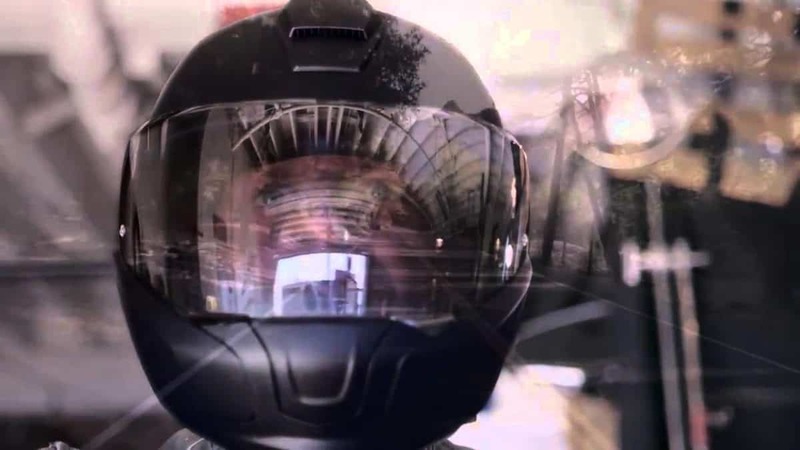 The GMax helmet allows the rider to transform his full-faced helmet to a half-face helm. 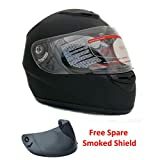 This type of helmet is great for those who want to take frequent breathers during long trips as the wearer doesn’t have to remove the entire helmet to breathe in fresh air. At the same time, the head and the face is fully protected in case of impacts. Key Takeaway: Buying a helmet can be a bit tricky especially if it is your first time because there are tons of products out in the market. The key to making sure that you’re getting the right helmet is to check what other customers have said about the product and by looking at the ratings. The top-rated motorcycle helmets can be your cue that it is a product worth trying and investing on. Even if you have no prior experience with helmets, just reading through the reviews and ratings written by other customers will make it easier for you to choose the most appropriate one. What are the best Brands of Motorcycle Helmets? Helmets are a requirement when riding a motorcycle; you can’t go without it as it is a prime protection for your face and head. Law also requires it; riding without a helmet can be an offense and you can face fines or charges. 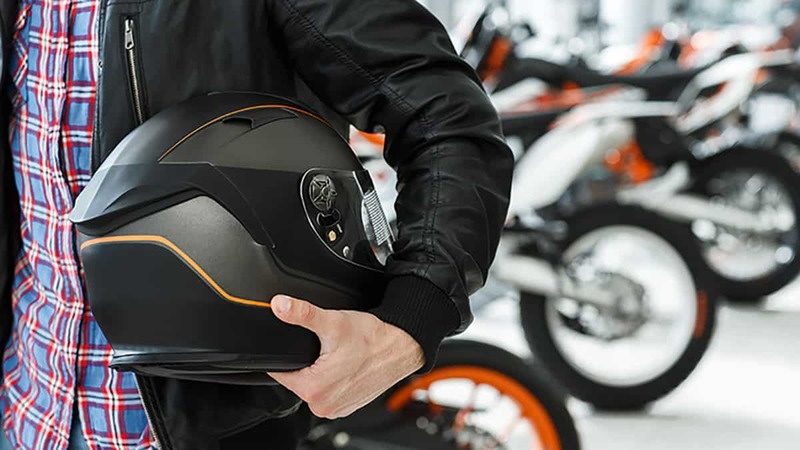 If you have just recently bought a motorcycle and you’re looking for the perfect helmet to accompany you on your rides, we have listed here some of the best motorcycle helmet brands. This can be a good guide especially if you have no idea with what’s out there that you can rely on. Choosing the best brands not only ensures you that you will get quality ones that can provide enough protection for your head but also you’ll get value for your money. 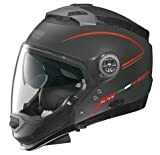 What are some motorcycle helmet brands that are worth checking out? 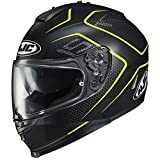 HJC Helmets – This brand is one of the bestselling brands in the United States because they create high quality helmets that compete with other expensive helmets without burning a hole in your pocket. Although HJC helmets are relatively affordable, it doesn’t sacrifice quality at all. Those who do not wish to splurge on a new helmet but would still want to get one that they can trust can opt for HJC’s wide array of helmets. Their products are manufactured in China, Vietnam or Korea where their factories are located. HJC has begun designing and manufacturing helmets since 1971. Advanced Polycarbonate Compact Shell: Lightweight, superior fit & comfort using advanced CAD technology. Impact absorbing, multiple density EPS liner. One-Touch Integrated Smoke-Tinted SunShield (HJ-V7): Deploys quickly and easily even with gloves on. 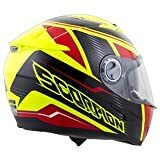 Scorpion Helmets – This brand is focused on technology and innovation so you can rest assured that helmets bought from this brand can give you not only protection but also ease when it comes to ventilation and aerodynamics. The company was started by Jang Park who used his 30 years of experience in the motorcycle industry to design the helmets. One of the ideals of the company is to create premium helmets designed after expensive racing helmets so that novice motorcyclists can bask with the experience of having such helmet without breaking the bank. Their helmets are manufactured near their headquarters in North America and Europe. SpeedView SunVisor: Retractable interchangeable internal sun visor. Choose the up or down position with the flip of the switch. Features our exclusive EverClear anti-fog coating on all surfaces. 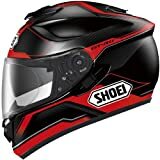 Shoei Helmets – If you are looking for a helmet brand that offers comfort, perfect fit, great attention to detail, high safety ratings, and premium materials, look no further as Shoei helmets have them all. These premium helmets have already built a huge following and fan base since its creation. For over 50 years, the company has been known to sell high-end helmets composed of carbon fiber and Kevlar shells. Most Shoei helmets are manufactured in Japan and they come with a five-year warranty so you can be sure that you’re getting your money’s worth and that the company is backing the quality of their products very seriously. Despite the large volume of sales and their popularity, Shoei remains as a small company with only about 500 employees. Shoei is definitely one of the best brands of motorcycle helmets. If you’re eyeing for one, be prepared to splurge, as the helmets don’t come cheap! SHOEI NEOTEC II - Experience the Versatility. When SHOEI first introduced the NEOTEC in 2011, riders worldwide realized not all modular helmets were created equal. With its lightweight, highly-aerodynamic shell, advanced noise reduction, and optimal vision protection, all combined with an ease of use (critical to a modular helmet), SHOEI had indeed achieved new heights in head gear design. 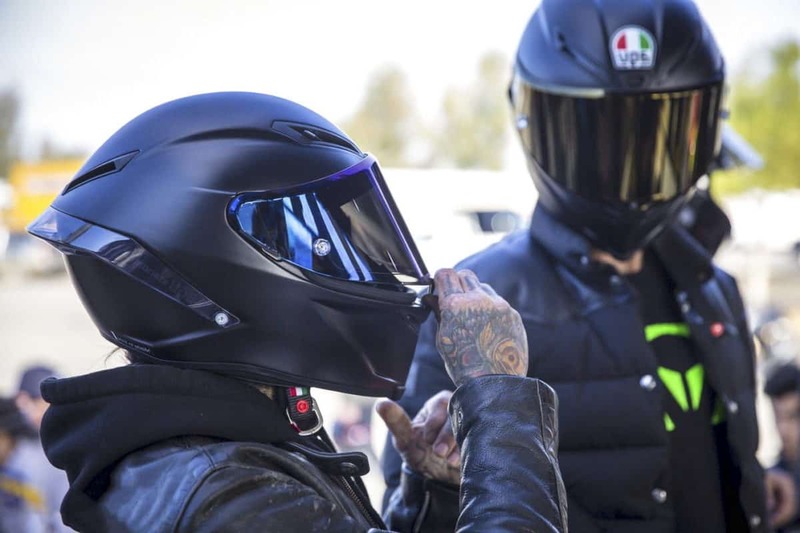 AGV Helmets – AGV stands for Amisano Gino Valenza, who is an Italian helmet manufacturer of highly regarded helmets because of its high quality and rich history. The company was established by only one person in his home’s basement in 1946. It grained prominence and rose through the ranks around the 1960s after many popular racers turned to use the AGV helmets. Since then AGV has been one of the best and reliable helmet brands. Because of its prestige and constant innovation, many riders flock to AGV. The brand is also fairly affordable and has designs that suit novice riders. Nolan Helmets – Like Shoei, Nolan is one of the most popular and established helmet manufacturers in the world. The brand is popular because of its continuous improvements and introduction of cutting-edge technology. Lander Nocchi started the company in 1972 in Mozzo, Italy and now the brand is being distributed to up to 70 countries. Nolan was the first used a thermoplastic material called Lexan 101 Polycarbonate that are lightweight and versatile, which is ideal for the production of helmets. They were also the first to have its own plant that manufactures scratch-resistant visors. As for the price point, their products are cheaper than Shoei, but slightly more expensive than the other brands listed here. Key Takeaway: The best motorcycle helmet brands listed above are very reliable and all produce DOT-certified helmets that will undoubtedly provide protection. Although they are more expensive than most helmets, you can surely rely on them for quality. When it comes to getting a helmet, consider first the material used, structure, comfort, and protection it can provide you. It doesn’t matter if you have to splurge a bit more as long as you can trust the helmet brand that you’ve chosen. Helmets are definitely one of the most important piece you need when going on a ride, no matter how short or long the distance, so make sure that you have a helmet from one of the reputable helmet brands, such as the ones listed above. What are the best Motorcycle Helmet Types? Depending on the nature of your ride or the type of motorcycle you own, there are many types of motorcycle helmets that could fit it. Lifestyle and needs are not an issue because you’ll always have something to rely on when it comes to head protection. Therefore, there is no excuse when it comes to wearing helmets. It is also mandated by the government, so you are required to wear one no matter what the type, no matter what kind of bike you own. The only thing that you need to consider is what the best kind of helmet will fit you. There are a few types of helmet types that will be listed and discussed here. It is great to review, especially if you have no idea about how each one of them differs. What are the most popular types of motorcycle helmets? 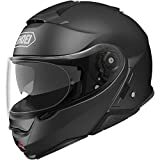 Open Face Helmet – This type of helmet is great if you don’t do extensive riding on the motorcycle and you only occasionally ride in tandem with a friend or family member. Open face helmet is relatively light, it’s not that thick, and as the name implies, it leaves the face exposed. The pros of an open face helmet or three-quarter helmet are that it is comfortable to wear and gives protection to the head. However, there are major cons – it leaves the face, the chin, and jaws very exposed to injuries. It also doesn’t have built-in eye protection against bugs and debris. It is also not recommended for extensive riding because a study found out that injuries and fractures on the face can still cause serious brain damage, making the helmet defeat its purpose. Half Helmet – This helmet is considered a “novelty” helmet because it doesn’t offer much protection for the head, especially if you plan to use it for rigorous motorcycle riding. It comes with a chinstrap but leaves the entire face and half of the head at the back exposed. It is also called beanies and shorties and is only great if you are riding at very low speed. You don’t usually see these helmets worn by motorcyclists. Instead, you mostly see this being worn by kids and teenagers when they’re on roller skates and skateboards as well as pedal bikes. 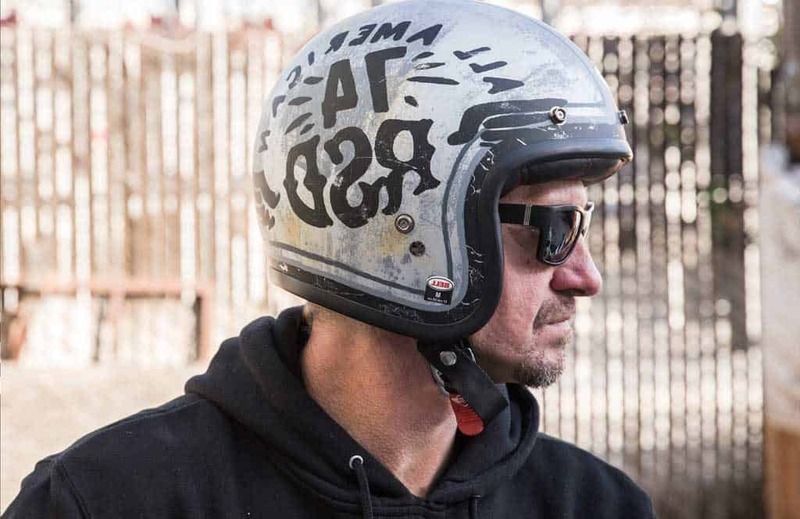 Scooter Helmet – This helmet is almost like the cross between an open-face and a full-face helmet. This is because this helmet covers from the brows up to the back of the head and has a chinstrap (like open-face) but has a built-in visor. This is not recommended for speed riding and suits slower motorcycles, such as scooters (hence the name). 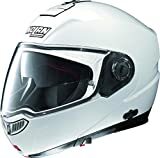 Full Face Helmet – This is the recommended helmet for motorcyclists because of the full protection it can give for the entire head and the face. There are many types of full-face helmets that cater to the different needs of the rider. The main thing that you should know about full-face helmets is that they’re recommended for long rides and they are lined with thick cloth and cheek pads for complete protection. Modular – This is the most versatile helmet out there because it is a full-faced helmet that gives utmost protection but you can convert it to an open-faced helmet because the thin guard and the visor can be lifted up, fully exposing the face (making it an open face helm). Touring – This is great for long-haul travel because it is more comfortable than other types. It also has great ventilation to keep the air circulating around the wearer’s head because it is intended to be worn for hours at a time, which can be taxing. 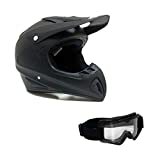 Dirt Motocross – The helmet for dirt motocross driving looks really different than the rest of the full-faced helmets listed here because it is designed to alleviate or totally protect the rider against any kind of injury. It has thick protection for the chin and the forehead, as it is more prone to hitting the ground. Sport – This type of helmet is great because of its aerodynamic design that makes it great for going against the wind without dragging too much. This is recommended for sports activities such as races. It also features a lightweight construction and a snug fit so it is able to fully protect still. Key Takeaway: When searching for the right helmet, make sure to consider what and how you’ll use it for. This way, you’ll be able to give the right protection to your head. Of all the types here, make sure to get something from the full-face helmet type because it is the one that gives the most protection. Don’t buy a motorcycle helmet just because of the looks. Make sure to consider your needs and the manner of use. Don’t be confused by the many types of motorcycle helmets available because each of them caters to the different needs of each rider. 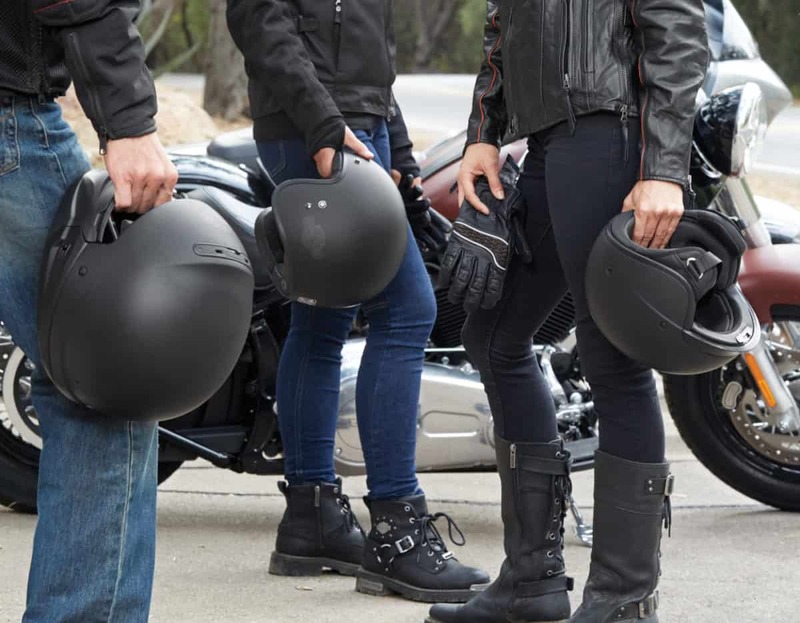 Whether you plan to use it for long rides, sports, or for casual motorcycling, there is always an appropriate helmet for every riding activity. 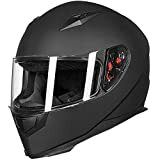 What are the best Full Face Motorcycle Helmets? Full-face helmets are your best bet when you want full protection for your head, as it doesn’t leave anything exposed from the neck up. Although other helmet categories other than full face, such as half helm and open face offer advantages like airflow and better visibility, nothing beats the traditional full face helm when you’re the type of person who wants the safest head gear possible. This is especially so if you’re the type of rider who likes to ride fast and you’re on your motorcycle for long periods. It doesn’t only give you full protection but it also makes your ride more comfortable as you don’t have to deal with constant cold wind hitting your face, as well as bugs, dirt, hail, and rain making contact with your face. 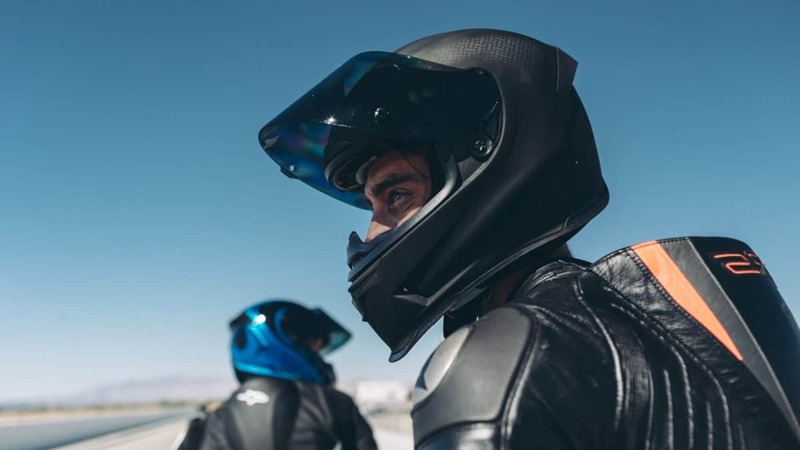 If you’re sold to get a full-face motorcycle helmet, take note of the factors to consider as well as some products we have listed to help narrow down your search. What are the factors to consider when buying a full-face motorcycle helmet? To make you sure with your purchase, we have listed some factors that you need to consider before shedding out hard-earned cash. This is so you’ll be certain that what you got is the best one for your needs and lifestyle. 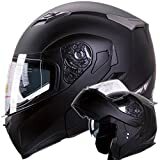 Protection – As mentioned before, full-face helmets are one of the best types that you can get as it fully protects the crown and back of your head as well as the entirety of your face. It also comes with a chin bar that doesn’t easily budge when it comes in contact with a hard surface. Motorcyclists who wear full-face helmets are also less prone to getting facial injuries and fractures because the helmet covers and protects well. Also, according to a study, those who don’t protect their faces are still prone to get brain and head injuries even though they are wearing helmets. It said that those who get facial injuries are 3.5 times more likely to cause brain injuries. Just imagine when you hit your jaw hard; it may vibrate all throughout the face and even reach the brain. This just means that wearing a half helmet beats the purpose. Interior Lining – Overall head protection is not enough. The interior should have a removable and washable liner as well as comfortable cheek pads. The pads make any impact on the head bearable or not felt at all. Heads and faces may seem hard to touch, but in reality these are soft and vulnerable. The interior lining also makes the wearer feel more comfortable during hot sweltering days. Just imagine your head stuck inside a big round ball; you’ll be sweating profusely. Some lings are great at absorbing sweat and they’re also washable so there won’t be any smell buildup. Aside from the interior lining, there are also vents built into some brands of motorcycle helmets, which make wearing it more comfortable as air can easily flow in and out of your head. The vents ease wearing a full-face helm because you won’t feel suffocated inside. Modular Full-face helmet – This is a type of full-face helmet that lets you lift the entire front part of the helmet up to expose your face. This type of helmet still gives you full protection but it gives the wearer the option to fully expose his face, in case he wants to breathe in some fresh air. What makes it different from other full-face helmets is that the latter only enables you to lift the visor up while a modular helmet also lifts up the chin bar. It allows you to transform your full-face helmet to an open face one without removing any parts and with usually just a push of a button. A modular full-face helmet is your best bet if you want full protection and freedom at the same time. Key Takeaway: Put safety first before anything else when it comes to choosing the best full-face motorcycle helmet. Although a full-faced one is considered too closed and uncomfortable, it’s the best kind that could give you full protection. 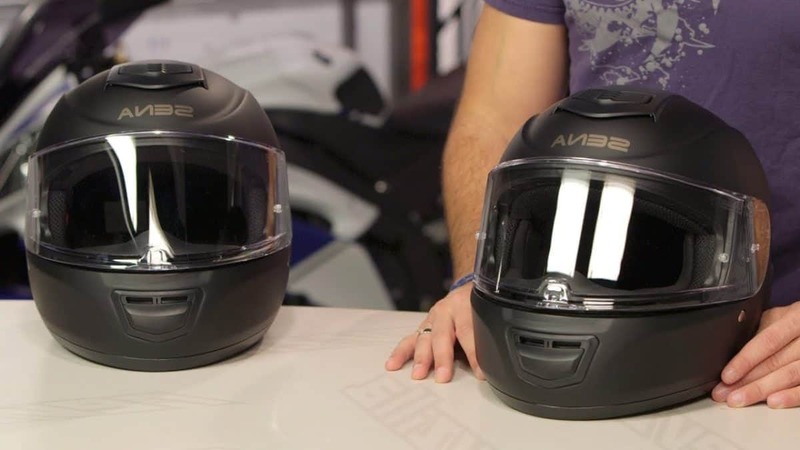 What are the best full-face motorcycle helmets? This helmet comes with circulation vents and two visors that are very easy to change. Some features include quick release visor mechanism, removable and washable cheek pads, and EPS impact absorption inner liner. It comes in sizes ranging from small to extra large. This modular helmet comes with a one-button flip up system that instantly converts it to an open-face helmet. Some features include a sweat absorbing inner liner that has EPS impact absorption that is removable and washable, lightweight durable shell, advanced ventilation system, and retractable sun visor. It is available in small, medium, and large. This DOT certified full face helm comes in black matte with silver star design and is available in varying sizes from small to large. Some features include an air pump technology that allows a customized fit, anti scratch and wide view clear visor, retractable inner tinted smoke visor, quick release visor mechanism, and ventilation system. Key Takeaway: Find the best motorcycle that you can rely on. Look for ones that allow comfort without sacrificing the quality of protection. 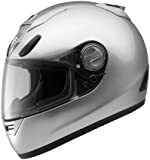 There are tons of motorcycle helmets to choose from that comes with different features while still being very affordable. 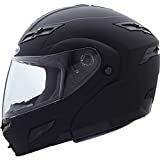 You can find the best full face motorcycle helmet without having to sacrifice comfort, good fit, and ventilation as many manufacturers constantly create designs that infuse all those while still being able to retain full protection. A good example is the modular motorcycle helmet that allows you to transform it into an open-face helmet. There are also ones that come in several ventilation systems and adjustable cheek pads. What are the Safest Motorcycle Helmets? Motorcycle helmets aim to give 100% protection to your head and brain, especially when going for a ride on your motorcycle. These vehicles are more prone to accidents especially because they are small and fast and are easily overlooked by motorists in big, covered vehicles. The driver of a motorcycle is also prone to getting hurt more than a person in a car because the driver can be thrown off the bike in case of collisions. As dire as it sounds, the body can be seriously damaged upon impact because it is very open and vulnerable. 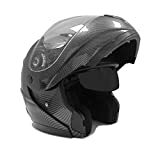 Therefore, having protection on the head as well as additional protection on the body (such as pads) are important before embarking on a long journey while on a motorcycle. However, not all that you can buy from stores can give you the utmost protection. You really need to check them out and look for seals that tell you they have been tested to protect against high impact and shock. How do you know that a motorcycle helmet is safe enough? Helmets save lives. However, it won’t provide you enough protection if it is not proven to do so. New helmets released by manufacturers are sent to the US Department of Transportation (DOT) to be checked and tested to see if these helmets are capable to protect your head in case of different levels of impact. The checking of all motorcycle helmets in the US is mandatory as it determines whether helmets being sold meet the federal safety standard. Not only is it illegal to not wear a helmet before riding your motorcycle but in some states, it is also illegal to wear a helmet that did not meet the Federal Motor Vehicle Safety Standard (FMVSS) 218 requirements. To make your search for the safest motorcycle helmet, first you need to check the packaging of the motorcycle helmet and look for a DOT sticker. The letters DOT should be strategically placed on the outside back of the helmet where you can easily see it. Bear in mind that DOT stickers sold separately that can be applied onto a non-complying helmet is considered illegal. You are not only breaking the law for doing such action, but you are also putting your life in jeopardy in case of an accident. The original DOT labels are permanently placed on the helmet and they can’t be removed by hand. If a sticker falls off the helmet, then it must not be DOT compliant. The next thing that you should check is the inside of the motorcycle helmet where you can find a Snell label, which is a symbol that it met the set of standards of this private organization. This is a good indicator that the helmet really meets the federal safety standard. Also found inside the helmet is the manufacturer’s labeling composed of name, model, size, month and year of manufacture, construction materials, and owner information. These labeling is required by the FMVSS 218. 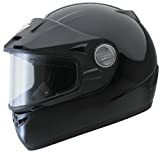 Other components of a safe motorcycle helmet should be a thick inner lining, about one inch thick polystyrene foam, sturdy chin strap, and solid rivets. Another indicator that tells you that the helmet is safe is the weight of the helmet. You can’t possibly trust a very lightweight helmet to protect your head upon impact, can you? Depending on the design, the usual weight of a good, safe helmet is about three pounds. When lifted, they should feel more substantial. By the weight itself, you should be able to know that it can protect your head when needed. Key Takeaway: Watch out for helmets with fake DOT stickers and labels. More often than not, you can come up with the conclusion that a helmet is unsafe based on the materials used, the price, and the place where you bought it. Be wary against stores selling very cheap knock-off items. Also ensure to carefully eye each part of the helmet to know if the materials used are sturdy and strong enough. This DOT certified helmet is open-faced and comes in a really cute design in matte white. It has a dual smoke and sun visor. The visors are anti-scratch, anti-fog, and wide clear view. The helmet comes with a lightweight, soft, and washable liner. There is also built-in ventilation system for optimum circulation. This safe, DOT certified helmet has a one-push button flip up system that instantly converts the helmet from full-face to open face. The helmet is lined with impact absorption inner liner that is also sweat absorbing. It is fully removable and washable too. The anti-scratch visor comes with an advanced ventilation system. The dual d-string strap is supported by durable stainless steel. The helmet comes in black matte finish and the irremovable DOT Safety Standard is stamped behind it. 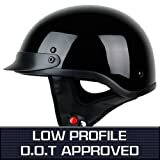 This DOT certified half-helmet is perfect for riding the scooter, Harley, Chopper and Cruiser. 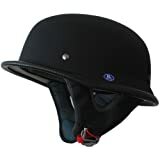 It is pretty lightweight but is still able to give full protection to your head. The interior is soft and comfortable and is able to bring in more air for circulation. A belt button for additional safety holds the double d-ring retention system together. Whatever type of motorcycle helmet you pick, be it full helm or half helm, and for whatever purpose you intend to use it, make sure to get one that will provide full protection to your head. The safest motorcycle helmets are tested first before they get a sticker of approval coming from DOT, which is your key in finding the best one. Before purchasing any motorcycle helmets, make sure that the DOT sticker is secured and that it is genuine. What are the best Motorcycle Helmet Speakers? Driving in any situation can turn from fun to boring in a matter of minutes, particularly when you’re on a long drive from one location to another and the amount of time spent commuting is increased by other drives making unintelligent driving decisions, stopping constantly at stop signs or even getting lost along the way to your destination. One such factor that helps to mitigate these problems is the curing of boredom, a task that is performed much easier in a car where there is access to music, radio and connection with your personal music player to give you something to listen to and enjoy whilst you’re waiting around in traffic. Sadly, this is not such the case with a motorcycle, which is completely opened up. Sometimes you will also want to listen to music when you’re on the move, but regular earphones are not comfortable, don’t provide the best sound quality nor do they fit securely underneath you motorcycle helmet which is protecting you. There are however items, which are designed for this situation, that are perfect for use when you’re commuting on your motorcycle and in the mood for some music or radio when you’re on your way. Using them can be much more efficient than alternatives and are created with motorcycle use in mind. 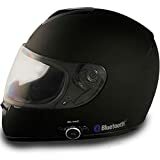 What are some choices of Motorcycle Helmet Speakers? Here is a selection of a few different motorcycle helmet speakers that can be used by just about anyone. 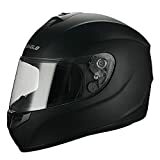 They are designed with the motorcycle helmet in mind as well as a variety of other factors that will be discussed further when determine what are the best features to have when purchasing one. These Motorcycle Helmet Speakers have Bluetooth compatibility making them perfect for portable use and preventing you from getting tangled up in a mess of cables. They have the ability to pair up through the Bluetooth features and have integrated controls to make them easy to use and easy to adjust. Designed to sit on your ears, these Motorcycle Helmet Speakers offer excellent quality sound with volume controls added to allow you to adjust it to higher or lower volumes depending on what you want. It is smaller and soft, making them comfortable to wear and also preventing them from being annoyingly intrusive when worn. If you do not want to miss the retransmission by a sporting event, a special flash information or want simply to listen to music while riding your motorcycle this radio and its enclosures especially designed for the motor bikes are the accessory which you seek. This radio allows you to connect your iPod, MP3, or other walkmans to listen to your own songs anytime! Benefits: Do not miss a sporting event or a special flash information when you are on the road Listen to music Function clock Adapt to any motor bike or electric bicycle The radio collects the band FM With its solid case waterproof and its robust fasteners the enclosures will constitute an addition of choice to your motorcycle while the radio will collect the band FM and the fasteners handlebar will make it practical and simple to use. Smaller and simpler in their design as well as having a lower overall price, these Motorcycle Helmet Speakers are designed specifically for outdoor biking and cycling conditions and are created to prevent outside noise such as wind and other factors. Safety features are added so they disconnect easily and prevent tangling. 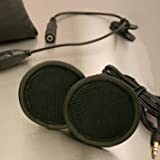 What should I look for in Motorcycle Helmet Speakers? The comfort of the Motorcycle Helmet Speakers is the first aspect of them that you’ll notice when they are in use. When it comes down to the helmet speakers which are used the most, if it is not comfortable then there is no reason to wear them. With that in mind the comfort of the speakers would perhaps be the most important feature. 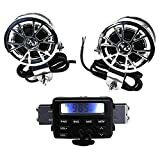 The durability of the Motorcycle Helmet Speakers is also important; as you want to justify the price you pay on them and ensure you get your money’s worth. Durability comes in the form of wiring that does not break sound quality that does not degrade and ability to be used multiple times without showing wear and tear. Volume is one of the factors as it is the main selling point of the speaker. Depending on your situation, you may want a very loud speaker (if you have a very loud motorcycle) or adjustable if you still want to hear your surroundings. Luckily, most Motorcycle Helmet Speakers should have some form of volume control. You also want to ensure that you can access the speakers easily as well as equip and unequipped them without a hassle. The same can be said for when you are stopped at traffic or off your bike. If they are difficult to remove then that can cause problems when you have no option but to remove them or need to immediately. Safety also ties into an important key aspect of these speakers, as safety is the most important part of the operation of any piece of equipment. Ensure that the wiring is not exposed or tangled with any part of the helmet. Additionally, ensure that there is no possibility that it can obscure your vision or become dislodged from the helmet. Key Takeaway: The price of the device should be considered. Whether or not you’re willing to pay for a high end priced Motorcycle Helmet Speakers or a cheaper version, in some situations it may be best to pay a little bit more to ensure you’re getting a combination of all the previously mentioned features as opposed to only a few. All of this information combined should make the process of determining the best Motorcycle Helmet Speakers an easier task and a better informed task, so that you can get the best possible product for your commutes. The prospect of travelling across long distances should become much easier and more fun thanks to these helmet speakers.